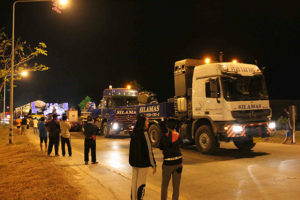 The 704-wheel truck trailer train carrying a new generator to Mae Moh power plant in Lampang, stopped at a weighing station in Ko Kha district of the northern province in the early hours of Wednesday. One of the tractors has been unhitched. 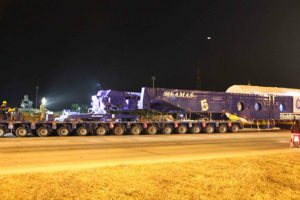 LAMPANG – A 704-wheel trailer train pulled by two large tractors transporting a huge new generator to the Mae Moh power plant was halted by officials at a weighing station in Ko Kha district on Tuesday night, to the disappointment of the many people lining the route to see it. It is a convoy of a size never seen in the area before and spectators had gathered along the road to view it. The Electricity Generating Authority of Thailand (Egat) on Wednesday posted a message on its Facebook page apologising to the people in Lampang for the delay. The trailer train was due to arrive at the power plant in Mae Moh district overnight, but it was brought to a halt at a weighing station just 80 km short of its destination. Officials examined the trailer train and decided the size of one of the two tractor trucks pulling it did not match the details the firm hired to haul it had previously given to authorities. Officials ordered the drivers to pull over and park at a nearby yard in front of the King Nasesuan Monument in Ko Kha district. The generator’s journey to the power plant came to a temporary halt about 2am on Wednesday, pending thorough checks. 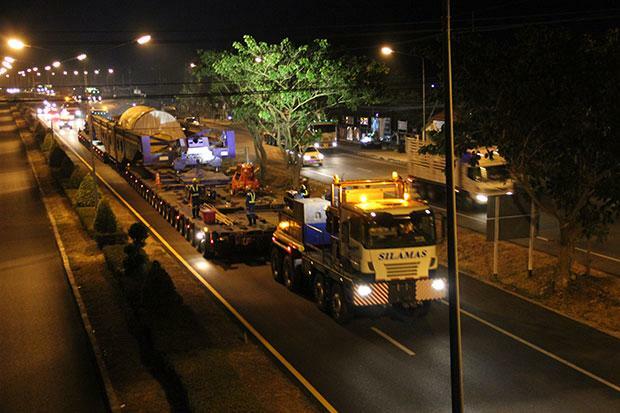 Residents from several areas in Lampang had been gathering along the route to the Mae Mo power plant since early Tuesday night and on into early Wednesday to see this long trailer train with 704 wheels. Many expressed their extreme disappointment at not having seen it as they returned home, Thai media reported. The trailer train is allowed to travel only at night, between 9pm and 4am, to lessen any disruption to normal road traffic. The new generator is for the fourth to seventh units at the Mae Moh power plant. According to the Egat website it is a generator stator weighing 358.54 tonnes, 10.47 metres long, 4.84 metre wide and 4.42 metre high. Two linked trailers, each with 352 wheels, were used to transport it. 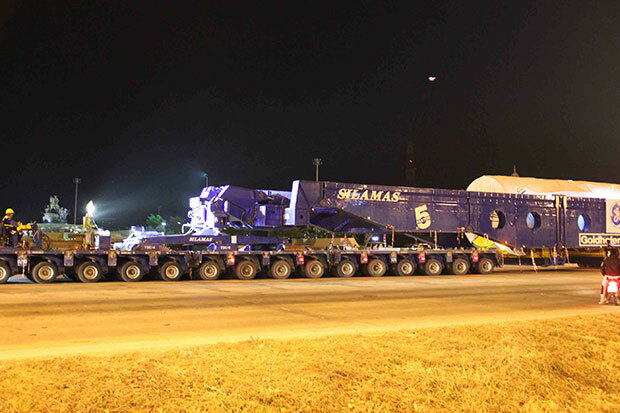 The generator was shipped from Poland to Laem Chabang seaport in Chon Buri, then carried up the Chao Phraya River to a port in Ang Thong’s Pa Mok district. The cargo was then loaded onto the truck trailer train at Pa Mok in the central province and has been heading slowly toward Mae Moh district each night since March 14. An Egat spokesman said later that the hauler, Silimas Transport Co, would replace the questioned tractor truck with another matching the details given to authorites. The Department of Highways had allowed the transporter to travel Phahon Yothin Road to Lampang via highway No 11. Because of the size and weight the speed was limited to a maximum 50 kph, the spokesman said.